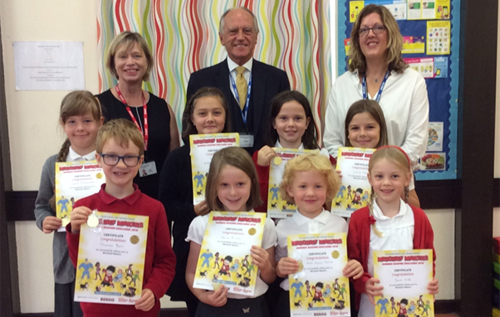 At the end of September, Norfolk County Councillor Greg Peck visited Reepham and Cawston primary schools and presented awards to children who took part in the Reepham Library Summer Reading Challenge 2018. Cllr Greg Peck (back row, centre) with Reepham Primary School head Catherine Ogle (left), Aylsham and Reepham Libraries manager Sara Caistor (right), and Reepham Primary School pupils who were presented with “Super Achiever” medals and certificates. This year’s challenge was called Mischief Makers and was inspired by The Beano, which is celebrating its 80th anniversary. The challenge runs throughout the school summer holidays and offers children of all ages a fun and engaging way to keep up their interest in reading over the summer. Children collected stickers as they read and completed the Beano town map to find the treasure. All children who read six library books received a certificate and a medal. Reepham Library had 73 children who successfully completed the challenge, some of whom also gave themselves extra reading challenges to become a “Super Achiever”. Reepham Library holds many events throughout the year. Coming up are slime workshops, craft events and author visits, as well as a regular Lego club. The library is keen to hear if there are any other events or clubs, for all ages, which people would like to see taking place. Reepham Library also works with the Royal Voluntary Service, offering those who are unable to come into the library the chance to have their books and audio books brought to them by fully vetted volunteers. For further information contact Reepham Library 01603 870474.